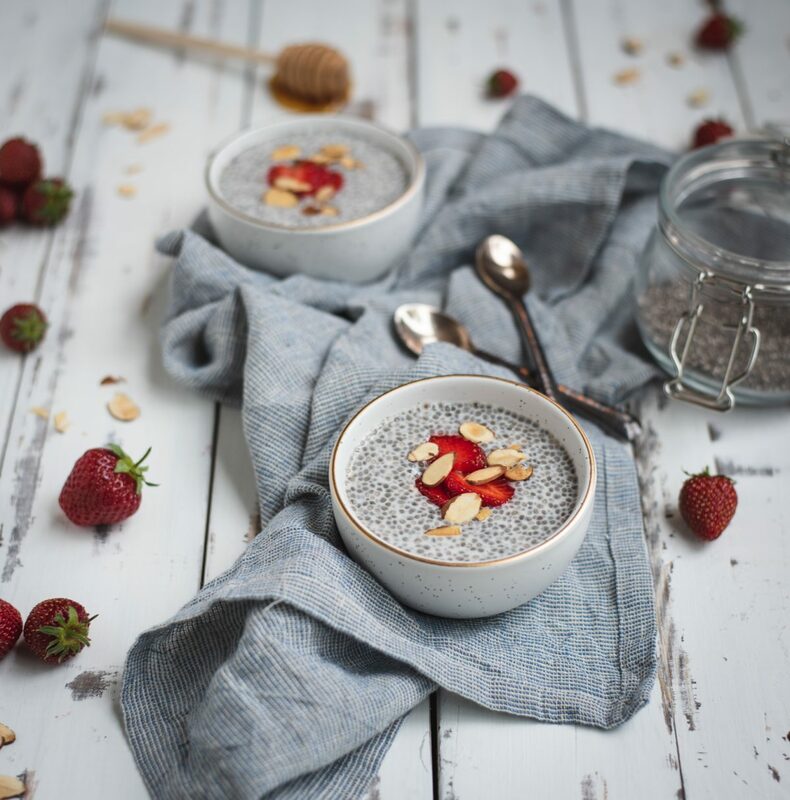 Healthy almond chia seed pudding is an easy, naturally vegan and gluten free make-ahead breakfast or desert that takes under 5 minutes to prepare! Cha-cha-cha chia! The most embarrassing part of growing up in the 80’s/90’s is that I didn’t even own a chia pet until a few years ago. Why I owned one past the tender age of 30? Not quite sure what inspired that. It was a present and I couldn’t bare to part with it. Growing up I had trolls and care bears galore, but no chia. 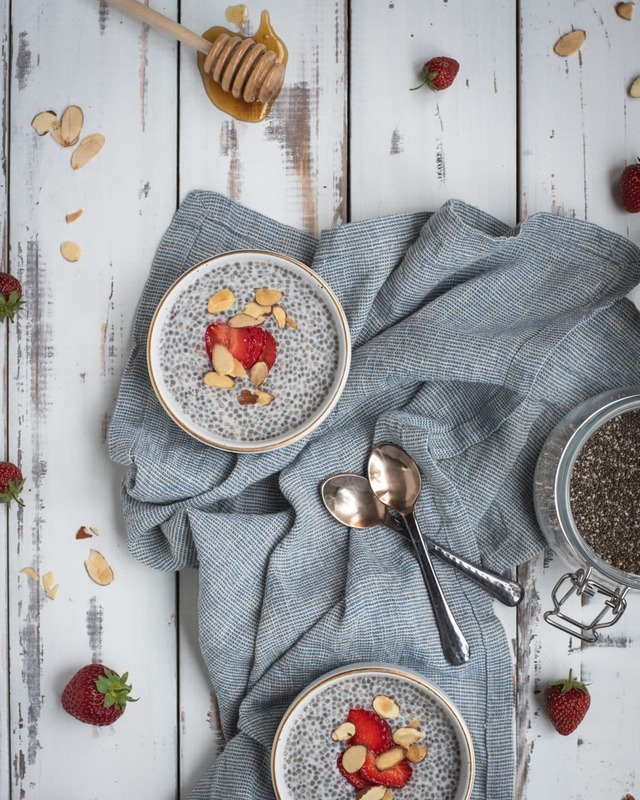 If you’re like me and totally missed the boat on the chia pet craze, its not too late… the grown up way to do it is almond chia seed pudding! Its like a healthy version of tapioca that makes for a nutritious fiber-packed breakfast or a light or a tasty desert. It sounds weird, but its really incredibly easy and delicious. No it isn’t like eating chocolate cake, but it is sweet and if you top with a touch of fruit, it totally works as a healthy dessert. We do it allll the time ’round here. Even my choco loving husband loves it. are high in fiber, but the basic nutrition stats don’t even tell the half of it. 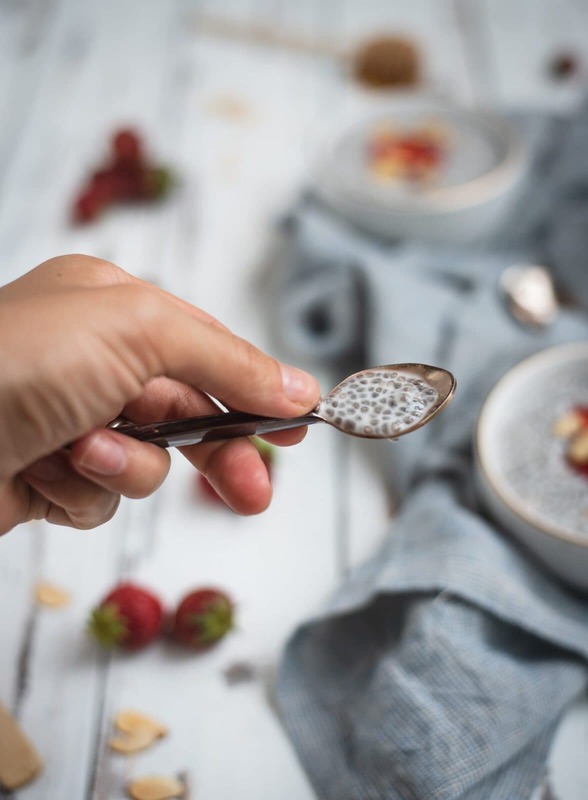 These tiny seeds are antioxidant superstars with one serving of almond chia seed pudding containing over 4,500 milligrams of Omega 3 and over 1500 milligrams of Omega 6 fatty acids. All that in a bowl of decadent tasting pudding? Sounds like a win-win to me. In fact, I think this is one of the recipes on this site that I have made the most. Its just so easy and I love having it lurking in the fridge for a healthy sweet snack that I can reach for instead of the ice cream. There are times for ice cream, but 9am on a Tuesday typically isn’t one of them. Life is such a bummer. Now, can we talk about the almond flavor already? I’m a sucker for pretty much anything with almond. I can barely resist a bear claw from a distance and if its in a pastry display and readily accessible, its all over. The obvious downside is that pastries are normally well over 400 calories, making them more of a dessert than a regular weekday breakfast option… Unless its fall. And its cold. Then, pastries are perfectly acceptable for breakfast. Not ice cream, but pastries on occasion. (Don’t ask me why – I don’t make the rules.) Luckily fall is right around the corner. For the rest of you that handle changing seasons like an adult, waking up feeling perky, healthy, motivated and not in need of a bear claw, this might be your new favorite breakfast. 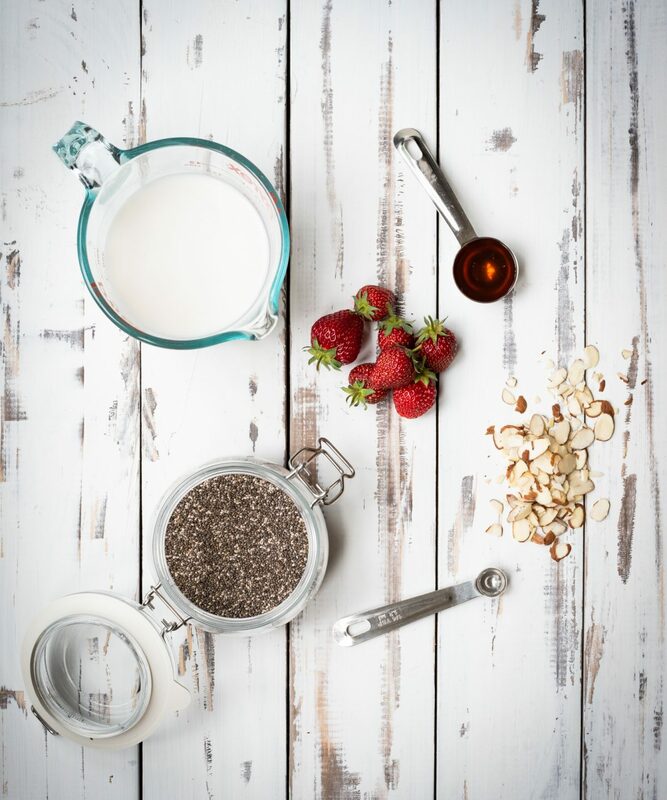 This almond chia seed pudding will fill you up and satisfy that morning sweet tooth without leaving you feeling weighed down and sluggish. I topped mine with strawberries here but you can eat it plain or top with whatever you want. 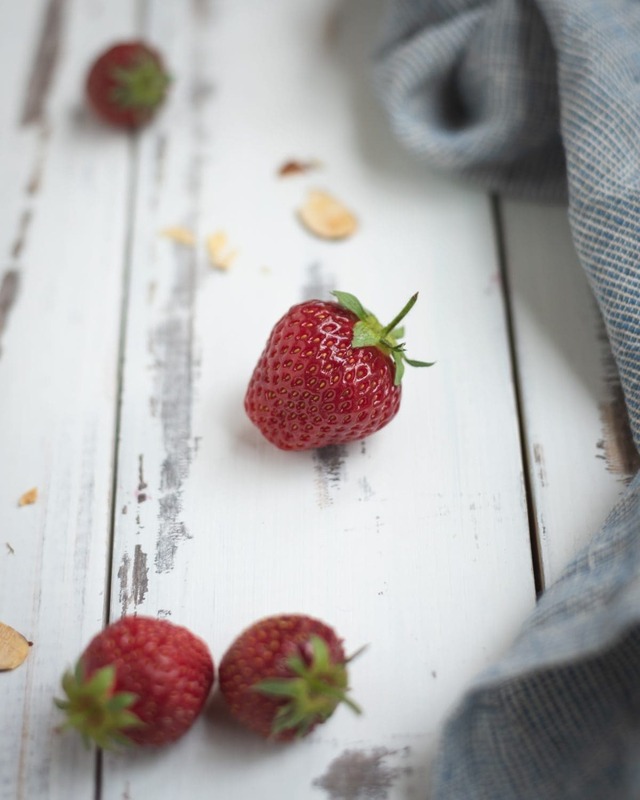 Strawberries and honey are just a match made in heaven in my book. I already paired these two lovers together with oats so it was only natural they would be reunited here. If the love is true the lovers always find each other. I think I read a Nicholas Sparks novel a decade ago that said that at least. If you haven’t made chia seed pudding before, you might be wondering how in the world a couple of simple ingredients can turn into a thick desert like this. That’s the beauty of chia seeds. If you’ve put them in smoothies or baked goods before, you’ve probably noticed that they get somewhat gelatinous after sitting in liquid for more than a few minutes. If you’re looking for a healthy dessert but this isn’t your thing, check out these baked pears, these raspberries, or these cheesecake stuffed strawberries. Combine all ingredients except toasted almonds and fruit and stir to mix well. Chill for at least two hours, preferably overnight. Stir 2-3 times throughout this time to disperse chia seed clumps. Divide between two dishes and top with almonds and fruit before serving. Will keep in the refrigerator for up to four days. * To quick toast almonds, place in the microwave for about 1 minute.